Chiang Mai Thailand is for many people the ideal place to settle down. It has the comfortable 20-30 degree temperatures, cheap and modern accommodation (advertising weekly and monthly stays), tons of restaurants, cafes and bars, and all other comfortable necessities you’ll need – western quality for a much cheaper price. It’s the second largest city after Bangkok, but compared to Bangkoks 11 million inhabitants, Chiang Mai is rather small and quiet with only 160 000. It’s likely that you will find yourself staying here longer than you intended, just spending your day hopping from cafe to restaurant to bar to market. I really liked the look of this shop window. There are so many things that it seems completely unorganized and random, yet they all seem to match each other in color! Food has a key role in Thailand, and in my opinion, the best place to explore this famous cuisine is in Chiang Mai. There are also a lot of choices for western, Indian and organic alternatives. The restaurants are lined up along every street. Along Mueang Soi 6 and around the small street corners are some great eateries, and there are some great cafes at Rachadamnoen road. The street food is best at the southern end of Taphae Gate. The Khao Soy soup is to-die-for, and the Chiang Mai Style Muesli Fruit platter is great! If you’re craving for something else than Thai food, El Diablo serves huge burritos and a big basket of fat nachos, worth the price. Learning how to cook in the food mecka of Thailand was my high light of Chiang Mai. I cannot recommend this enough. I took a cooking course and had an amazing time. Aside from cooking, you learn so many things about Thai cuisine and traditions. Choose your school wisely, as the teachers are what makes the class. We chose Asia Scenic Cooking School, and our teacher Gay Ray was fantastic. Massages in Chiang Mai are incredibly cheap, often down to half the price of the ones in Bangkok. A normal price for an hour Thai massage is 120-200 Baht, and an oil massage is from 200 Baht. A local Thai woman told me that just like every Thai woman can cook, they know massage. However, some parlors are just nicer and more romantic than others. Green Bamboo and Fah Lannah Massage are both great places, a little more expensive (200 baht) but really professional and very nice rooms. If you like, there are massage places all down the Loi Khro rd on the street giving foot massages for a cheap price, although it’s not quite the same experience. I must admit that we had had our fare share of temples by the time we finally reached Chiang Mai. But there are so many temples in Chiang Mai that you can’t walk 30 meters in the old town before you walk past another temple – they’re everywhere! They’re all beautiful, and in some you will see the surrounding gardens full of small and big statues of all kinds, that you normally wouldn’t think would fit in; Donald duck, Ganesha, a rooster, a cow – they’re all around the temple, which makes it a fun change. Buddhists in Thailand strongly believe that worshipping at temples is a way of making merit, and a popular thing to do in Chiang Mai for Buddhist monks and locals is to visit nine temples all in one day, during a special holiday. Sounds like a crazy thing, but it’s pretty manageable as all of these nine important temples are close to each other in the old city (click here to read more about the nine temples). If you want to join their tradition, go ahead, otherwise I suggest you just walk around in the old city and choose the ones which look interesting. If you like markets you will love Chiang Mai. Every hour of the day there is a market going on some where in the city. 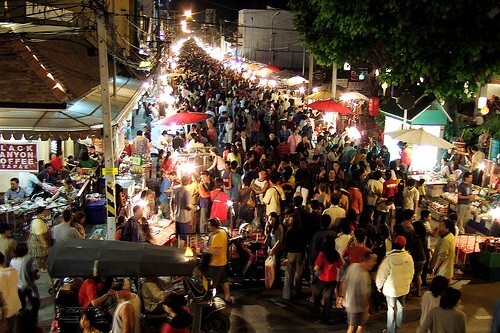 Weekday or weekend, morning, day or night – there is always a market going on. There are morning markets spread out all over Chiang Mai, Somphet is the one which is closest to the guest houses in the old city, a perfect place to buy some fruit or coconut for breakfast. Other great markets are San Pa Khoi market and Muang Mai market. The markets in South East Asia are a feast to the eyes as well as a shock. Fish, candy, fruit and meat all mix together in a mish mash of stalls. During the rest of the day there is the Warorot day market up at Chiang Moi Rd, a favorite for shopping among the locals, perhaps because you can buy anything and everything here. This market in the center of the old city along Ratchadamnoen Rd, the stalls are crammed next to each other and live music performers line the middle of the street. Try to visit the market on a sunday which is not during a holiday season, as it’s more quiet and less crowded then. There is also a Saturday market down the Wua Lai road from late afternoon til midnight,some prefer this one over the sunday market. This market is on every night, and you’ll find anything from lanterns to clothes to jewelery. Just make sure to shop around for the open prices, as they vary a lot between the stalls for the same thing. One of my favorite things to do when I travel is to visit the local markets; the smells, the pace, the people, the colors and the food is always such a fun experience, and it gives a great insight into the daily life of the people and the culture of the country you’re in. Every second shop down the main streets in Chiang Mai will be a tour agency trying to hook you up with a trek or tour. There are many different types of tours to choose from, and I suggest you shop around comparing prices between different agencies. The tours usually include an elephant ride, a tribal village, some trekking and bamboo rafting. A scooter is a great idea if you want to see the outskirts yourself. You don’t have to go to the tribal villages with a tour, but are more than welcome to go there by yourself too. Just be careful, I saw more people injured from scooter accidents in Chiang Mai than I’ve seen in total in the rest of Thailand, the drivers are pretty reckless, and just because the streets are emptier it doesn’t mean that they’re much safer. A bike is a great way of getting around the area, not just the old city but if you want to bike a bit further and check out some malls and spa’s. Udan Thani has 1.400.000 folks and how many of you remember how perfect Chiang Mia was in the late 70’s. Those temples are so unique….I love Thailand’s food!!!! Chiang Mai is by far the most amazing place i visited in Thailand and with so much to do in the surrounding area it was amazing. We made our own way to the elephant sanctuary and hitched a ride home after an amazing time. We met some really nice people who invited us to meal with the whole family so we got a real taste of Thai food and hospitality! Also learned some Thai and tought some English to them!